I am not a skin care expert, but I play one with my friends. Nothing brings me more joy than a girlfriend texting me from Sephora with a question about which products she should buy; it validates all the hours I spent buried in skin care blogs and YouTube videos in my early 30s, when I started to panic a bit about aging and wanted to lock down a serious routine. I’m fascinated by the science of skin care, but if you’re new to the game, the sheer volume of products and hyped ingredients on the market can be completely overwhelming. Over the years, I learned a lot about what actually works, and realized how many clever marketing ploys are out there to make you throw money at fancy products that have zero research to back up their miraculous claims. Some of my favorite dependable sources on the interwebs are Caroline Hirons, Gothamista, Stephanie Nicole and Susan Yara; these ladies know their stuff and I trust all of their recommendations and advice. 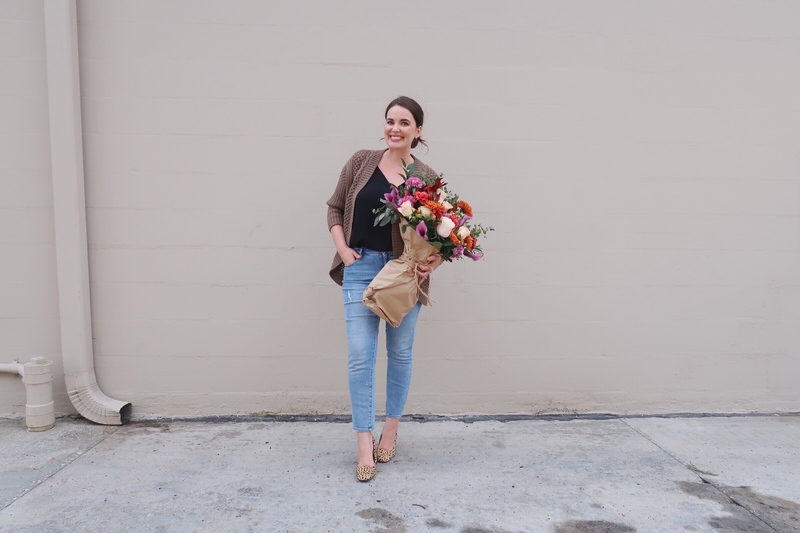 Before we get started, I feel the need to throw out a disclaimer: everyone prioritizes their spending differently; I drop a considerable chunk of cash on beauty products; and I especially splurge on my skin care routine. At 34 (almost 35) I’m all about prevention and maintaining my skin at this point; I’m not necessarily trying to turn back the clock, just hoping to age gracefully and well. Also, I’m personally not ready for injectables and/or invasive professional treatments, so I’m willing to invest in products that will help me stave those off for as long as possible. With that said, I’m all for doing whatever makes you feel your best and most beautiful; if clinical interventions are your thing, find a great doctor/esthetician and go for it. You may also notice that I use a lot of ‘clean’ beauty products, and that’s just a personal choice that makes me feel a little better about all the stuff I pile on my face and body; I also notice that they tend to jive better with my sensitive skin. I do my best to avoid sulfates, parabens, phthalates, junk ‘filler’ ingredients, and excessive fragrance in all my skin care products, but if I’m being honest, I’m not sure about all the ‘toxicity’ and chemical fear that’s going around right now. Yes, we absolutely need cosmetics reform in our country (regulations haven’t been updated in decades) so we need to be our own best advocates for what we put on our bodies, but it’s important to recognize that there are a lot of companies that use this hyped-up fear as a marketing tool to sell you stuff. There are plenty of ‘natural’ things that aren’t good for your skin, and many well-researched ‘chemicals’ that are completely safe and effective. So be informed, educate yourself about the ingredients you put on/in your beautiful bod, and do what’s best for you. 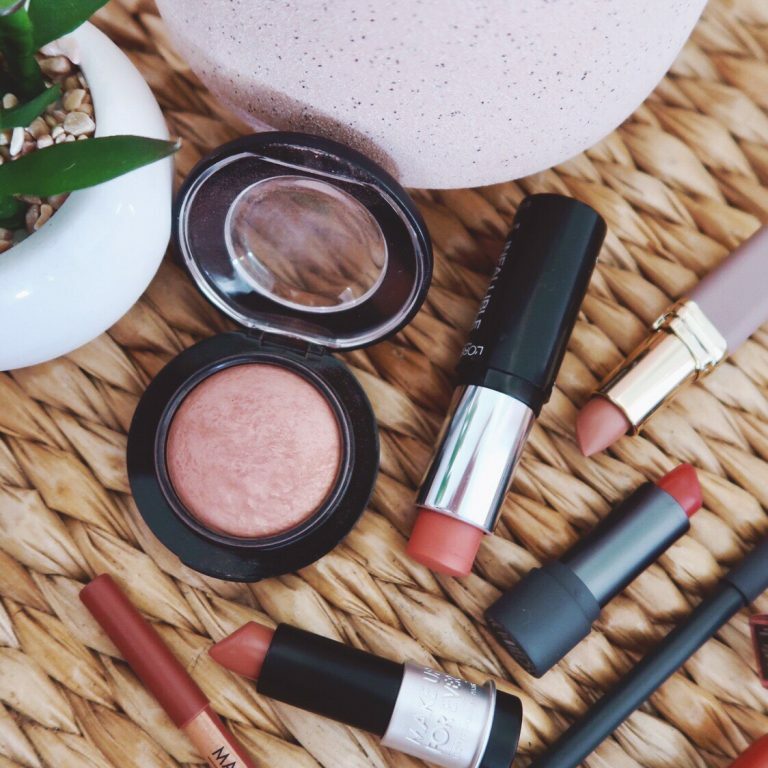 Finally, you absolutely do not have to spend a ton of money to build a great routine — there are so many innovative brands bringing affordable and effective ingredients to the market — and the ladies I mentioned above have all kinds of helpful resources on effective products for all budgets and lifestyles. Okay, on to my routine! I’ve used some variation of this morning skin care ritual consistently for the last 2-3 years, and while I sometimes experiment with new products, the active ingredients/major steps always remain the same. The major keys to a great routine are: 1.) using the right ingredients to protect and defend your skin throughout the day, 2.) layering in the right order, and 3.) nailing the timing so your products have time to absorb and work together to perform at their maximum potency for the best results. I stumbled upon this video by Violet Grey of Skin Care Layering 101 two years ago, and found it really helpful and informative. I start my morning routine with a balancing, non-foaming cleanser: I massage it directly onto my dry skin (as in, I don’t splash my face with water first) and wipe it off with a warm wet washcloth; I’m currently loving these plush bamboo facial washcloths from Amazon. I alternate between a cleansing oil/balm, a gentle physical exfoliation cleanser — don’t put crushed walnut shells and seeds on your face because they cause micro-scratches that damage your skin and make it vulnerable to bacteria — and a cooling clay cleanser with exfoliating acids to remove buildup and improve tone and texture. I’m currently rotating through Tatcha’s Camellia Cleansing Oil and The Deep Cleanse, Emma Hardie Moringa Cleansing Balm, and the Pixi Glow Mud Cleanser (available at Target). I also really love Fresh Soy Face Cleanser, but I just polished off a tube and I’m waiting to finish other cleansers in my stash before I repurchase. If you want a quality drugstore option, try CeraVe Hydrating Facial Cleanser. This is a non-necessity extra step, but Caroline Hirons recommends sandwiching in extra moisture wherever you can, and I do just about whatever she says. I typically shower at night to wash and air dry my hair — and give myself a few extra minutes of sleep in the morning (see: I am not a morning person) — but if I start my day with a quick shower I always cleanse and spray on a hydrating face mist before I jump in; I feel like the mist gives my skin a protective barrier from the heat and steams some hydration into my pores. 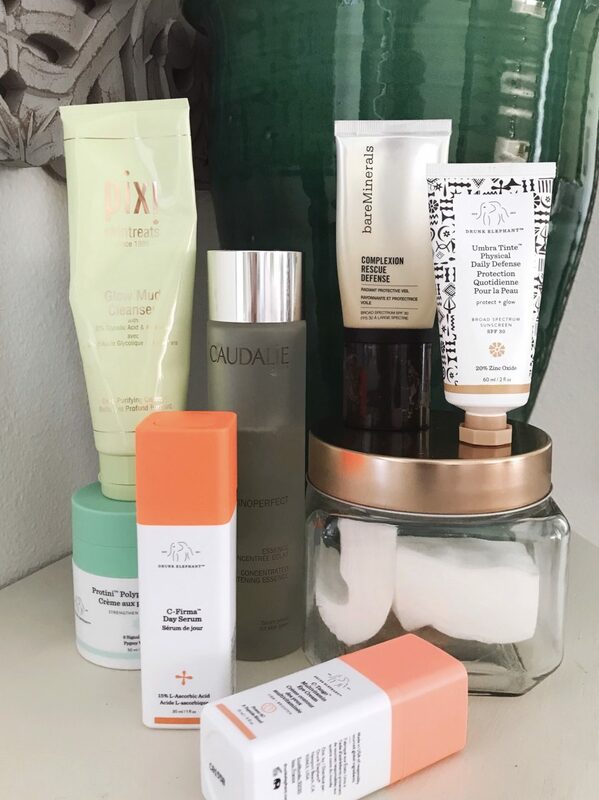 My two favorites are Biossance – Squalane + Micronutrient Fine Mist and Tatcha Luminous Dewy Skin Mist, but I’ve used and enjoyed the Clinique Moisture Surge Face Spray Thirsty Skin Relief, too. You can get a decent rosewater glycerin spray for around $10 on Amazon. A note: I try my best to avoid getting hot water on my face in the shower because it’s really not great for your skin; I washed my face in the shower for all of my teens and 20s and couldn’t figure out why my skin was always dry, red and irritated when I got out. Now I never wash my face in there, and try to be mindful about not letting shampoo slide down my face, either. Essence and toner are not the same thing: the purpose an essence is to lock in hydration, balance your skin’s pH, and prime it for your serum and moisturizers; an ideal toner should have exfoliating AHA and/or BHA acids* to improve texture and tone by deep-cleaning your pores and removing buildup from the top layer of your skin. I alternate between the two, but usually reserve my strong acid toners for the evening. 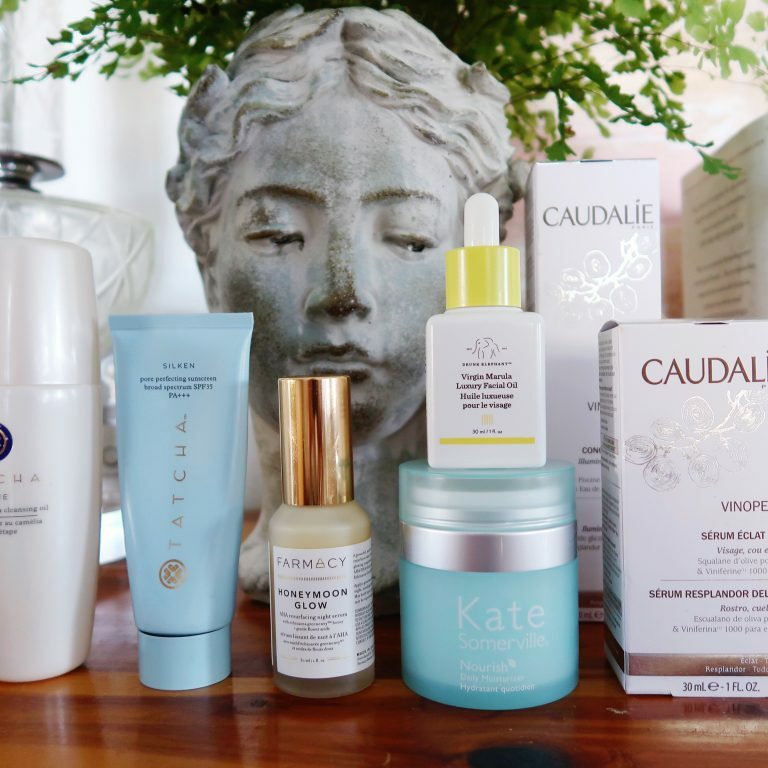 I’m currently working through a big bottle of Caudalie Vinoperfect Glycolic Brightening Essence, which is the best of both worlds with a mix of natural hydrators and gentle exfoliating acids. (I have my eye on the Fresh Black Tea Kombucha essence when I finish the Caudalie.) I pour a small amount into my hands and pat/push it into my skin, starting at my chin and working my way up, then putting what’s leftover on my neck and chest. I like to give it a few minutes to soak into my skin before moving on to the next step, so this is when I usually make my first coffee of the morning. There are lots of great essences in the Korean beauty market for all skin types and budgets but I haven’t dipped my toe into that market yet; check out Soko Glam for lots of helpful K-Beauty information + products to shop. 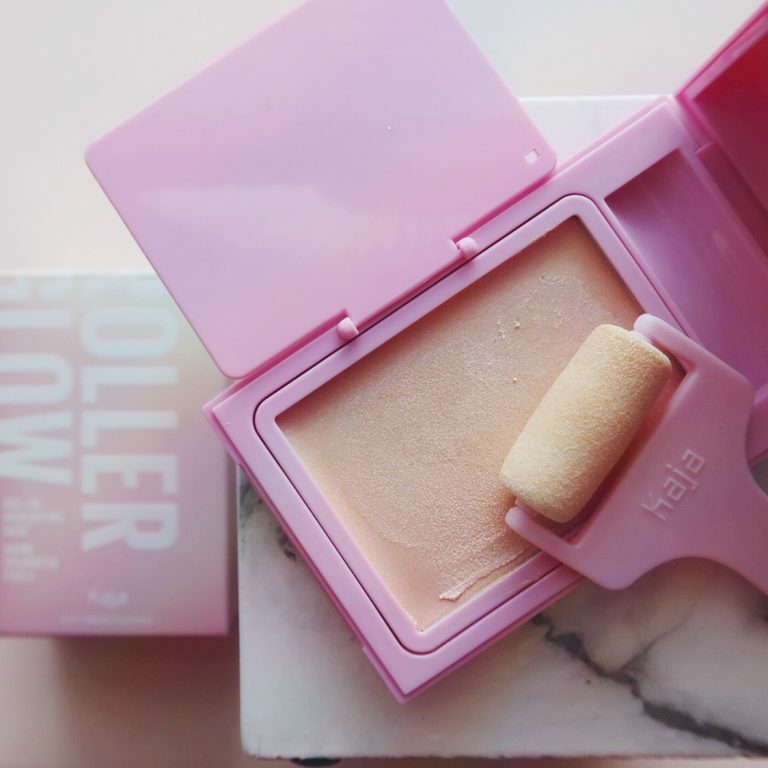 A great beginning AHA toner that’s budget-friendly is the Pixi Glow Tonic To-Go pads; they’re pre-soaked with the perfect amount of solution and are gentle enough to use every day when you’re just starting out (in my experience). *If you use any products with AHA or BHA, be mindful that they increase your skin’s photosensitivity, making you more prone to burns and sun damage, so be sure to be really diligent about daily SPF. Think of a good vitamin C serum as your daily glow booster and antioxidant defense against free-radicals and pollution. 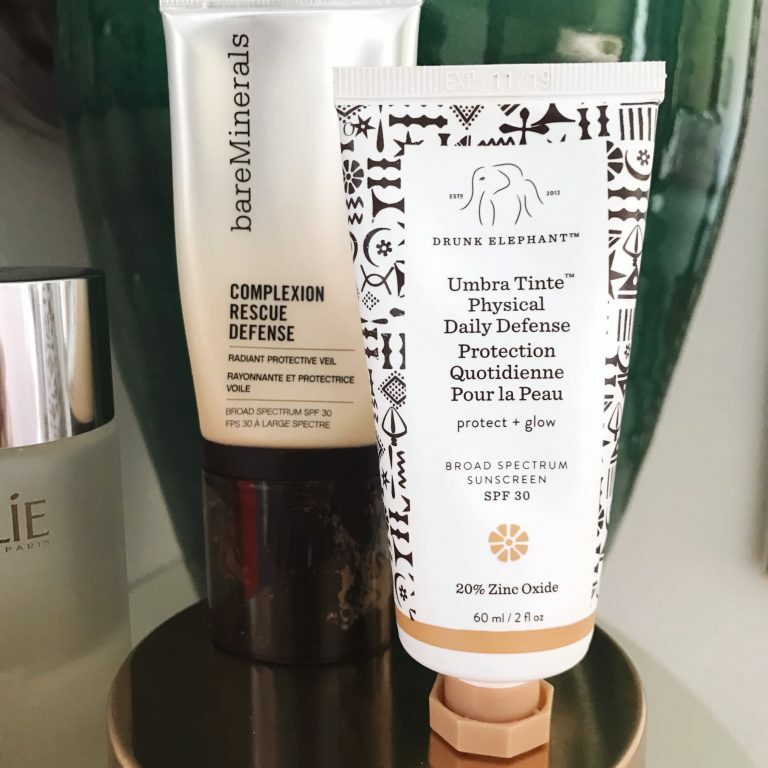 When I incorporated the Drunk Elephant C-Firma Day Serum into my routine a few years ago, I noticed big changes in my skin’s tone and texture, and I haven’t stopped using it. I replace the bottle every 6 months to make sure it’s at its maximum potency, and apply it from my face to my chest every morning so I don’t have much (if any) left when its time to start a new one. If my skin is dehydrated, I mix a couple drops of their Virgin Marula Oil into the serum to make a little cocktail before I press it into my skin. I like to give it at least 20 minutes to fully absorb before I layer anything over it, so I use this time to make the bed, get dressed, prep my breakfast/lunch for the day, and tidy up the house from the previous evening. I know there are other great vitamin C options on the market, but I haven’t bothered trying them because I’m so dang happy with C-Firma. 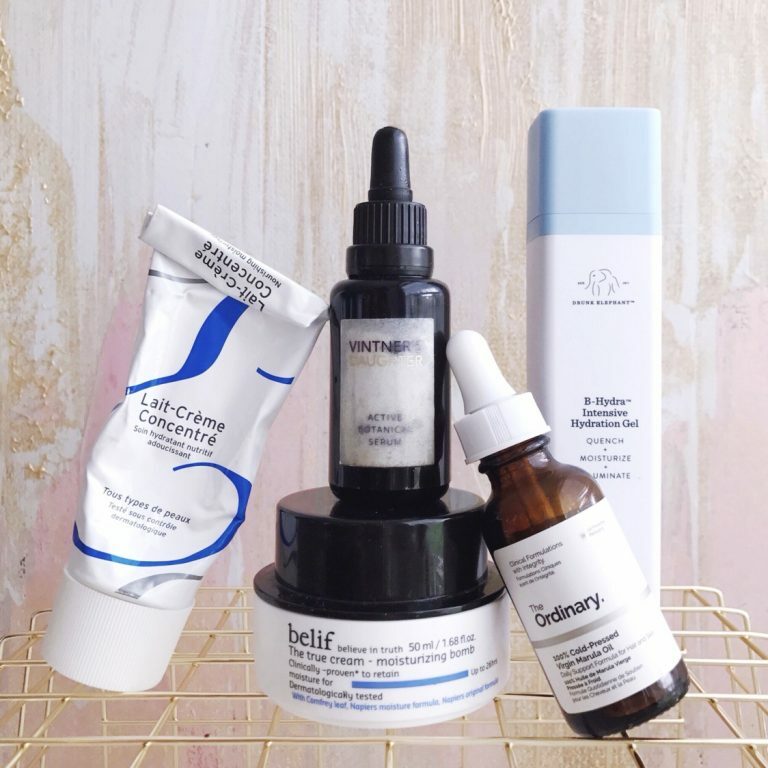 My girlfriends love the SkinCeuticals C E Ferulic serum, and Sunday Riley’s C.E.O Rapid Flash Brightening Serum is a popular choice that won the Allure ‘reader’s choice’ award last year. Need more guidance? Gothamista dives into vitamin C derivatives in this video. 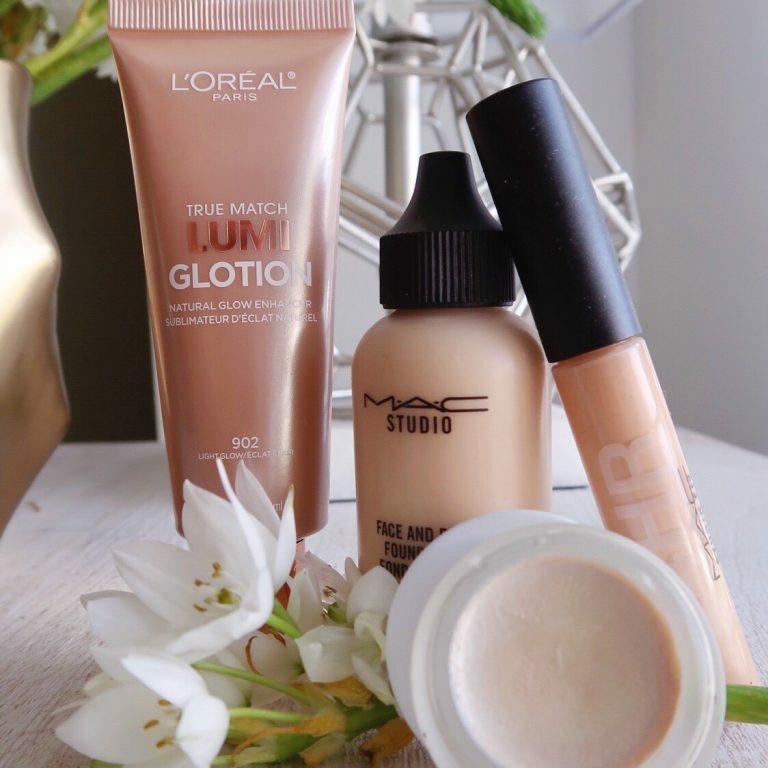 A lot of skin care gurus will tell you an eye cream is a luxury splurge that you don’t really need; if you’re using a good moisturizer with beneficial ingredients, you can take it up to the eye area and get great results. I like incorporating eye creams and serums into my routine because the extra step makes me focus on taking care of the delicate skin around my eyes, and I do notice a difference in hydration, ‘plumpness’ (ew) and texture when I’m consistent about it. No matter what it claims, an eye cream won’t eliminate your age-related dark circles; you can thank genetics and loss of fat and thinning skin under your eyes for that. Save your cash and talk to a dermatologist about under-eye filler if that’s a big concern for you. 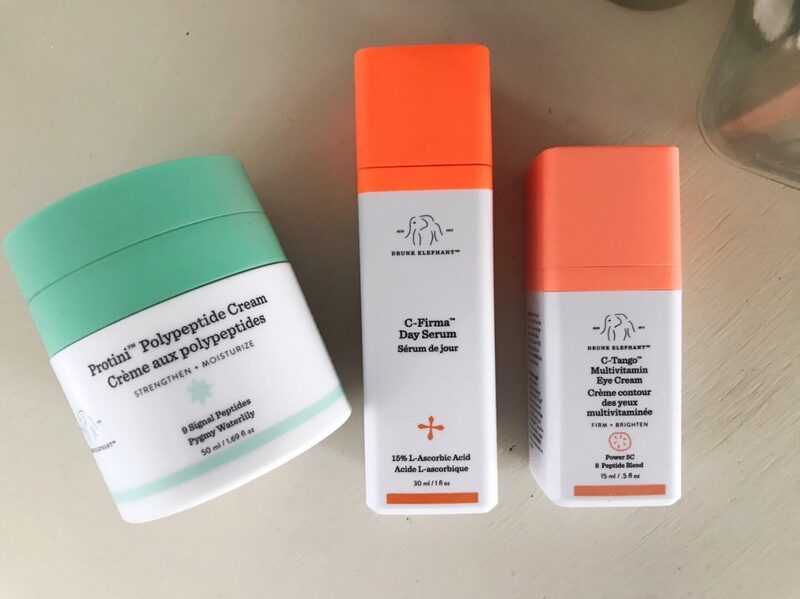 My two favorite daytime moisturizers right now are Drunk Elephant Protini Polypeptide Cream and Kate Somerville Nourish Daily Moisturizer. Both are antioxidant-rich creams that lock in all my serums and potions and keep my skin hydrated all day without feeling heavy or greasy. I love that both come in a jar with a pump to keep the product air-tight and hygienic. I use one pump, warm it up in my hands, and press it into my face and neck. This just needs a minute or two to absorb before I move on to my last step before makeup, which might be the most important. I never leave the house without sunscreen on my face, neck and chest. Lately, I’m even spraying my body down with an SPF 50 mist with vitamin C before I head out the door (this one is my favorite because it doesn’t feel greasy and has a subtle citrus scent). In the last year, I started to keep a small bottle of sunblock in my bag to apply to my hands throughout the day, and a bottle in my car at all times in case I need it on the go. I’m obsessed with sun protection, and you should be, too. If you think you hate sunscreen, there are so many new formulas that feel great on the skin, don’t smell or leave a white cast, and wear well under makeup. 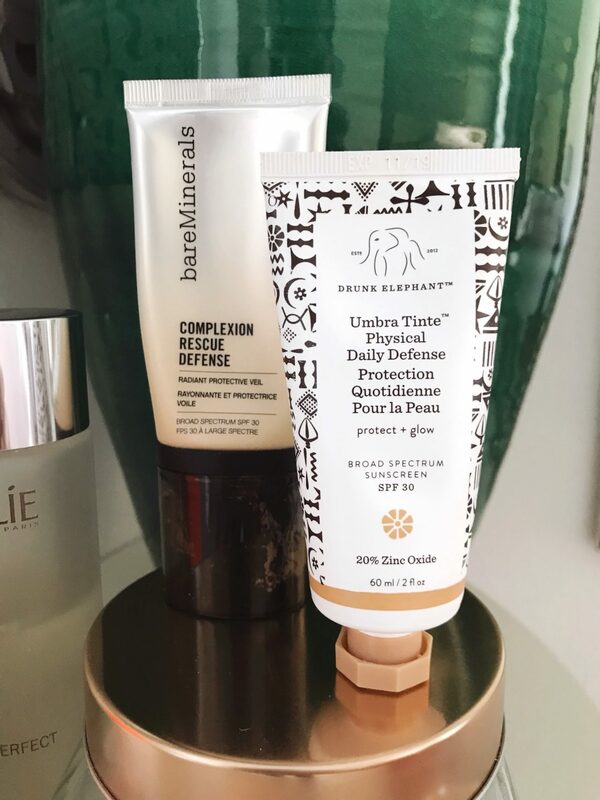 I have a handful that I love that I’ll share soon in a separate post, but my everyday top 3 are: Tatcha Silken Pore Perfecting Sunscreen Broad Spectrum SPF 35, BareMinerals Complexion Rescue Defense SPF 30, and Drunk Elephant Umbra Tint SPF 30. I use a nickle-size amount every morning to cover my face and neck, and another nickle-size dollop to cover my chest and shoulders. And I’m done! If a six-step skin care routine feels excessive, or you don’t think you have the time in the morning to layer on products and wait between steps, just give it a try and watch the results. It’s definitely worth the time and effort when you start to see big changes in the tone and texture of your skin; I imagine it’s like going to the gym and working out consistently, but #cantrelate. I’d love to hear your favorite products and the morning rituals that help you start your day off on the right foot. I’ll post my evening skin care routine in another post, because wasn’t this one long enough? Ha! If there are any other skin care topics you’d like me to cover, let me know in the comments! Or slide into my DMS on Instagram. I could talk about this stuff allll day. I am 26 and thinking that maybe I should be doing something to my skin other than washing it and putting on SPF… but I always find skincare so intimidating! There’s so many products, and some of them are so expensive! This post has definitely pointed me in the right direction. I just totally procrastinated what I should be doing and loved all of this. My sunscreen collection is HUGE. SUPER helpful!! thank you! 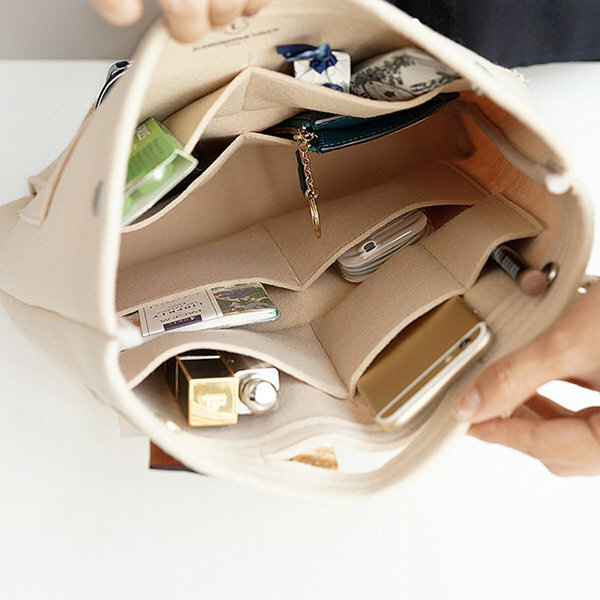 skin care products can be sooooo overwhelming! i’m in my 30’s and also have started really investing in my skin, considering breakouts have just NOW started happening. ew! love this & im definitely going to take some of these recommendations! it’s also reaffirming to hear products mentioned that i have heard about recently! thanks keira..you’re beautiful!